For exhilarating games of catch, nothing compares with the Aerobie Pro flying ring, used in setting a Guinness World Record for the farthest throw – it flew an amazing 1,333 feet / 406 meters. For truly exhilarating games of catch, the Pro ring has no equals. You can actually play catch with a friend more than 100 yards away. The soft rubber edge makes catching soft and easy. Even today, more than a decade after the Pro ring’s creation, onlookers are still amazed by this incredible flying ring. Size: 13 inch diameter. Available in orange, yellow, and magenta. Ages 12 and up. Quality made in the U.S.A. 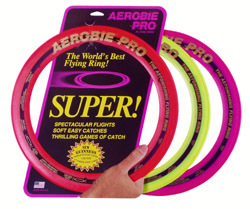 The Aerobie Sprint flying ring, a compact version of the world’s farthest thrown object, flies twice as far a regular disc for awesome games of catch. Compact and lightweight, the Aerobie Sprint ring flies twice as far as conventional flying discs for awesome games of catch. Its smaller size is its only distinction from the otherwise identical Aerobie Pro flying ring, which was used in setting a Guinness World Record for the longest throw. Ideal for those who enjoy the incredible flying performance of Aerobie rings but have a smaller area for play, the Sprint ring is great for backyards, parks, playgrounds, beaches, and camping trips. The ring’s soft rubber edge makes it comfortable to catch and fun for throwers of all skill levels. Size: 10 inch diameter. Available in orange, magenta, and yellow. Ages 7 and up. Quality made in the U.S.A.
Also try the Aerobie Pro flying ring, a larger model of the Sprint ring which was used in setting a Guinness World Record for the farthest throw.